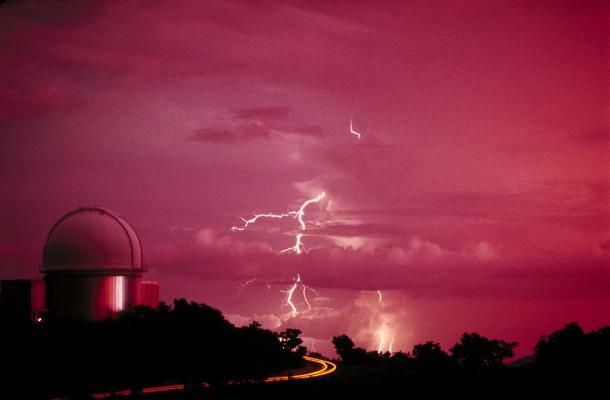 Opis: Telescopes are not very useful during lightning storms. Nevertheless, with lightning illuminating a dark landscape, the picturesque dome of the famous Kitt Peak 2.1-meter Telescope makes for a dramatic photograph. A passing car created the red and yellow streaks visible in the foreground. The 2.1-meter Telescope has participated in many important astronomical discoveries including the discovery of the Lyman-alpha forest, the first gravitational lens, and the first pulsating white dwarf.